Hookstrip Pyramid Screens are the more effective screens. The screen area is 125% to 150% larger than flat screens. 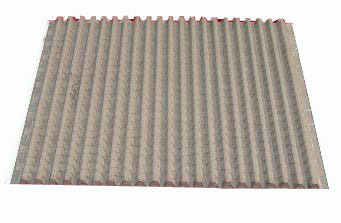 The using of pyramid screens can improve the fluids handling capacity and increase the production. Hookstrip Pyramid Screens are the replacement products of flat screens. The effective area is 125% to 150% of flat screens. Without changing the construction of shakers, the using of the pyramid screens can improve the quality of drilling fluid and increase the production. We can supply pyramid screens with mesh sizes ranging from 60 to 250. ?Different layers with different density. To arrange these layers reasonably and exactly, the screening effect will become more and better. ?The waved cloth bonded to metal backing plate, has more surface . The effective area of a pyramid screen obtain 125%to 150% of a flat screen so that pyramid screen can load more drilling fluid flow. shale shakers a fine screen cloth is used with the vibrating screen. The screen may have two or more overlying layers of screen cloth or mesh. Layers of cloth or mesh may be bonded together and placed over a support, supports, or a perforated or apertured plate. The frame of the vibrating screen is resiliently suspended or mounted upon a support and is caused to vibrate by a vibrating mechanism (e.g., an unbalanced weight on a rotating shaft connected to the frame). Each screen may be vibrated by vibratory equipment to create a flow of trapped solids on top surfaces of the screen for removal and disposal of solids. The fineness or coarseness of the mesh of a screen may vary depending upon mud flow rate and the size of the solids to be removed.